And yet death did not come. Peering behind him he saw nothing but green trees and foliage. Was this a miracle? He glanced around him, but there was nothing but the sweet sight of life and all its dangerous shadows. It wasn't until he stood up that he realised the truth. There, right in front of him, was a large hole. At the bottom were sharp, wooden spikes and on those spikes, lay the bloody corpse of the creature. Dead. It was impaled through the [affix gore and detailed nastiness here] which was quite funny, in a way. "Sweet!" he said to himself. As he turned away, it suddenly struck him that no mindless beast could have made this trap. "Oh, wait" he thought, as he realised that he was probably going to have all sorts of fantastical adventures and almost die a bunch of times. His legs still hurt, too. 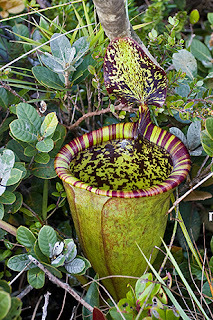 The Pitcher Plant is a bit like that, except it doesn't use spikes to [affix gore and detailed nastiness here] like marmalade without bits in. No, it drowns them instead in the liquid filled pitcher. This liquid may be full of bacteria or enzymes to break down insects and such into easily absorbed mush. 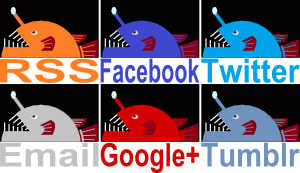 Which is much nicer. Some of the larger ones can also trap lizards, frogs and sometimes even rats. It just gets better and better, right? 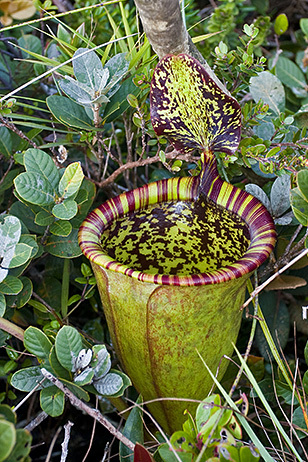 There are actually two kinds of Pitcher Plant. The Old World variety are found in southeast Asia, with a few extending to Madagascar, India and Australia. In these, the pitcher forms at the end of a tendril that extends from a normal leaf. Many of these plants use the same tendrils to climb up trees to find more light. Others grow in forest clearings or even right there on a tree branch. New World Pitchers grow on the ground and form their pitchers from the entirety of a leaf. They're found over most of the Americas. Either way, Pitchers attract prey using bright colours or nectar. The sides are rendered slippery with grooves, downward facing hairs or a waxy covering. As usual for carnivorous plants, they grow in poor soil where their extra food source allows them to survive where others can't. One of the biggest rat killing ones was only found in 2007. 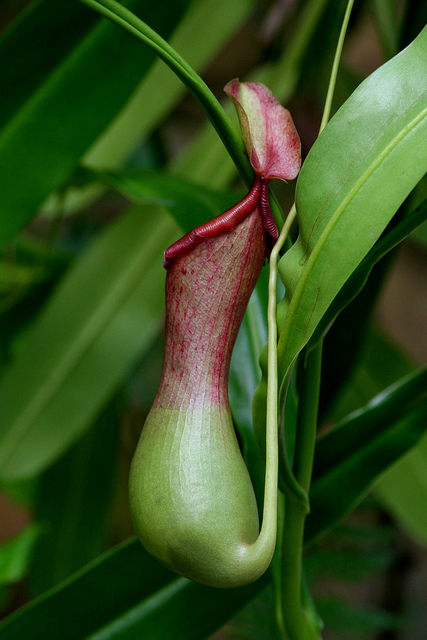 It was named Nepenthes attenboroughii after David Attenborough. That must be great for him since he doesn't like rats after one leapt out of a toilet he was using one time. I guess I'll say that he had an upset stomach at the time (before the rat I mean) and leave it at that. No detailed nastiness from me. I certainly join you in that thought! I don't even want to know too much about what happens to those rats. Hahahaha!!! I think you and I may have slightly differing definitions of the word "wonderful"! Carnivorous plants are simply fascinating, aren't they? You told a wonderful story. Thank you! And yes, they are very fascinating. I love to see the different methods they have for catching prey, it's very interesting. Pitcher plants are common in the bogs around here. Recent research has determined that there is a specific species of ant that has learned to avoid the trappings and utilize the nectar of this crazy plant species. I did not know the details about the old world variety. I wish we had pitcher plants that could harvest mammals! Great post. An escape artist ant, wow! There always seems to be an ant somewhere capable of taking advantage of just about anything, amazing stuff! We have a pitcher plant species in Sri Lanka too. It's declining fast I think. It's cool you have one where you are! I hope you don't lose it.